A database consulting firm specialising in SQL Server, Access, VB, Exchange Server and ASP.Net development. IT consulting firm specializing in the creation of n-tier, Internet and client/server business applications using PowerBuilder, Visual Basic and Java. Linux Consulting, network, server, hardware, software, middleware. Web planning. Santa Clara, California. Oracle and Microsoft SQL Server architecture, Microsoft (CRM), and Microsoft .NET technologies are the tools of this Florida/Tennessee Customer Relationship Management consulting firm. The DSW Group offers Borland Delphi Client/Server hands-on training and consulting with Inprise certified instructor developers. Consulting services include network consulting, network engineering support, wide area communications, document management, time and billing, and law firm technology specialists. Information Technology consulting firm, specializing in IBM mainframe systems software support, enterprise server technology, and mainframe connectivity to other Client/Server and e-business platforms. Consulting, Training and Development Services. Provides database design and development services for client/server, file server and web-based three-tier database applications. A commercial Jabber server, that has been written without using already available source. The server can be integrated in to the Merak mail server. Client/server training and consulting specializing in PowerBuilder and SQA Suite. Secure Internet mail server software, supporting unlimited users, unlimited domains, POP3, SMTP, IMAP4, HTTP, LDAP, ODBC protocols, on-server virus scanning, on-server spam filtering and built-in web mail server. Advanced fax server software for PC networks. Two versions of the software is available, a 16-bit fax server for Microsoft Windows and a 32-bit fax server which will run on Windows 95 and as a 32-bit service under Windows NT (Intel or RISC CPU) Server or Workstation. Consulting company specializing in SQL Server, Visual Basic, and Crystal Reports. Develops EJB, JSP and servlet solutions as well as full applications for the desktop or server. Consulting and contracting. French APL based company. Proudly announce a form 'driven by an APL+Win Web Server'. Provides computer infrastructure design, network security and maintenance, server migration and other IT services. Developer of NAS, CD/DVD Server, SNMP/HTTP Adapter. Offers a combo NAS device that also functions as a CD/DVD server and file server. A framework to develop Web based applications with an embedded Web server. Around this Web server a lot of services have been developed. Application server that provides Servlet-like API to C++ programmers. It consists of stand-alone daemon, listening on TCP socket for requests from web server, and a web server module. Connectivity software that allows a UNIX server to act as a file, print, and application server for a variety of client PCs in a network. Services offered include web design, development, hosting, online promotion, server maintenance, and IT consulting. If the business hours of Lod.com in may vary on holidays like Valentine’s Day, Washington’s Birthday, St. Patrick’s Day, Easter, Easter eve and Mother’s day. We display standard opening hours and price ranges in our profile site. We recommend to check out lod.com for further information. 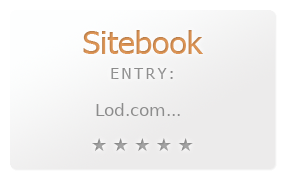 You can also search for Alternatives for lod.com on our Review Site Sitebook.org All trademarks are the property of their respective owners. If we should delete this entry, please send us a short E-Mail.